Editors and publishers have been throwing spaghetti at the proverbial wall since about 2005 looking for something that sticks when it comes to finding a new economic model for journalism. It seems that The Guardian, via its membership scheme, has finally found something which is gaining some traction. Last week Guardian News and Media revealed that it now has 300,000 paying members and supporters, a further 100,000 digital subscribers and 100,000 print subs. So 500,000 readers who are making regular payments to support its journalism. Guardian supporters and members typically pay £5 a month, however they can pay more. Subscribers to the premium Guardian app and digital edition pay £11.99 per month. So digital subscriptions might be contributing around £15m a year to The Guardian bottom line and members/supporters at least another £18m annually. A further 300,000 readers have made one-off payments to The Guardian as a result of its pleas for financial support. While GNM has made huge progress over the last year or so, in terms of recurring payments digital members and subscribers are still a long way from providing enough money to offset declining print income. The £33m from these two sources compares to total turnover last year of £214.5m for the Guardian and Observer. 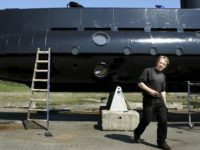 The official loss (EBITDA) was £44.7m, but in cash terms the business spent £67.3m more than it earned. Guardian supporters/members will need to approach a million at the £5 per month rate if they are to form the basis of a new sustainable business model for the title’s journalism. At that level, they would offset the losses leaving other revenue streams (such as advertising, dating, events and print) to cover the rest. Nonetheless, GNM’s current management team deserves credit for inventing an entirely new revenue model for British national newspaper journalism. When the scheme first launched in 2014 I had my doubts about it. The idea of paying £15 per month as it was then for a discount to Guardian events and the same journalism which all other online readers get for free seemed to me highly questionable. 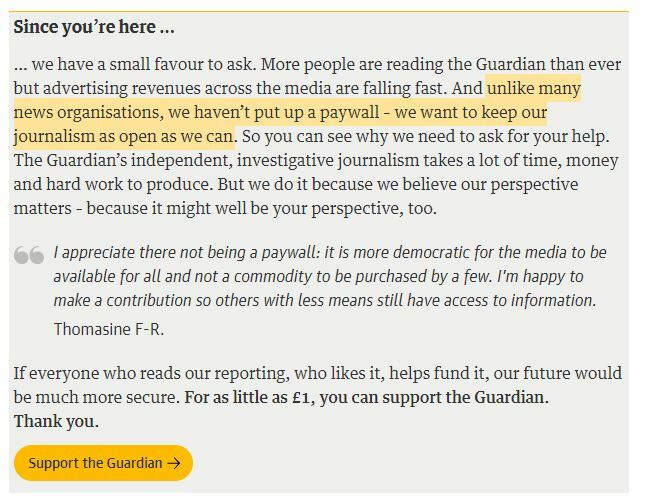 Since then the lowest tier of membership has dropped to £5 and the marketing has become far more insistent, with the message: “Since you’re here … we have a small favour to ask” appearing at the end of every single Guardian article. The killer move for the scheme has been moving away from marketing a membership with associated benefits (which struck me as a poor deal) to a instead encouraging readers to become “supporters”. The Guardian has doubled down on former editor Alan Rusbridger’s open journalism model. Paying £5 a month for not just yourself but everybody else to receive all The Guardian’s journalism for free forever, suddenly looks like a good deal – provided 700,000 more people who feel the same way can be found. They can be found for The Telegraph due to BREXIT/UKIP and its supporters! Wish they would offer this same model! “It seems that The Guardian, via its membership scheme, has finally found something which is gaining some traction. So why won’t The Telegraph use the same model? Could do wonders for their subscribers given that a few of them cancelled their subscriptions [with non-subscribers not wanting to take out subscriptions] due to them recently giving REMAINERS Tony Blair and John Curtis platforms for their own REMAIN/Labour Party propaganda to be printed in their own columns on the paper!